This digital advertising 101 guide gives a breakdown of the different type of AdWords campaigns, how Bing ads can increase conversions, the different types of LinkedIn advertising and ways Twitter can boost your conversions/leads/followers. If you’re going to invest in digital advertising, Google AdWords is one of the best places to start. If you don’t want to use up a bunch of time on SEO efforts and want to see immediate results, this is your ticket to conversions. You can place ads above organic results, show your ads across the Google Display network and create rich-media ads/videos that make you stand out from the clutter. Your placement is dependent on the relevancy of the search to your ad, bid amount and quality score. If your landing page is well-designed and fulfills the ad promise, you won’t have to pay as much to land on the first page. 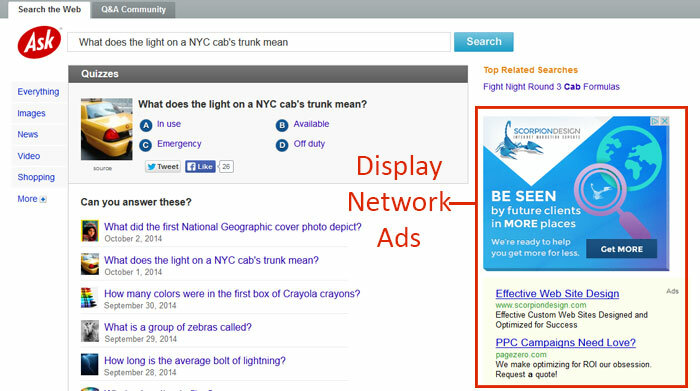 With Search Advertising, you can add on extensions to make conversions more likely. These can include anything from call extensions (users can get ahold of your business with one click) to sitelink extensions (users can see other products/services that you offer besides what’s included in the ad content). The system is set up so that you’re only charged by clicks/impression received, and the ability to adjust your budget daily gives you complete control. You can even set up a conversion tag to see which clicks are actually leading to profit for your business. Analytics give you the ability to see which ads aren’t working, what time of the day is bringing in the most conversions, and which locations you should be targeting to maximize effectiveness. The most common type of AdWords ads is Cost-Per-Click, which only charges you when your ad is clicked on. With the display network, your ad could be placed on thousands of different sites within Google’s partner network—including YouTube. Placements are made based on your keywords, topics you want to target and other demographics. The nice thing about these ads is that you can get more creative than search advertising ads. Video ads, animations and images are all possible if you choose to go with the display network. An essential part of digital advertising 101, Bing Ads is Google’s primary competitor when it comes to search engine advertising. Choosing between Bing and Google can be a tricky choice. Results vary depending on the product you’re trying to market. For example, one study found that running duplicate ads on Google and Bing over a 45-day period produced drastically different results. It was 63.23% cheaper to gain a conversion on Bing compared to Google, and the overall conversion rate for the three Google campaigns was 5.96% compared to Bing’s rate of 8.78%. Since the landing pages were the same across both networks, they concluded that the behaviors of Bing users was substantially different from Google users. Like AdWords, they run auctions to determine placement and have a similar interface to display ads. You’ll be able to filter your target audience by location, profession, groups they’re a part of, education level, school attended, etc. Since it has to be sent from a personal account rather than a company one, you’ll have to be a first degree connection with whoever is set up to be the sender. Users will not be able to respond to these InMail messages. You can create custom salutations that include their name and profession. Include a banner image that’s 300 by 250 pixels. Add a hyperlink in the body to a landing page that’s geared toward conversions. You’ll want to keep your target reach between 100,000 and 300,000 people. Bidding system based on sends, not clicks or impressions. Only sent to active LinkedIn users. Marked as ‘sponsored’ in their inbox. Under 1,000 character of conversational text and include call-to-action. You can A/B test different images, call-to-actions, text, subject lines, target audiences, etc. Offer them something they can’t refuse (ie: free download of PDF document outlining your services) or an infographic. Can include 50 by 50 pixel image. Show text ads on the side used for targeting. Can be CPC or CPM. Shows up in user’s feeds (targeting people who visit LinkedIn for news/info/updates rather than to just check their notifications). You can target the ads. Bidding based on CPC or CPM. You’ll need a compelling thumbnail image. Include stats/figures to draw attention. Call out your audience, use ‘you’, and explain what value they’re getting out of it. Landing page forms should be short. Relevance score assigned to ad (calculated by click through rate, comments, likes, shares and member feedback). This means a good ad saves you money as well as drives conversions. Used to promote updates that you’ve made on your company page (ie: an introductory blog post, downloadable PDF, video, etc.). This kills two birds with one stone. You can sponsor an update in more than one campaign if you’d like it to reach multiple target audiences. Intent-based targeting: Retarget website visitors, CRM contacts, lookalike audiences, and more using your own first- or third-party data tracked and managed through your preferred demand side platform, data management platform (DMP), or data warehouse. According to The Social Media Examiner, there are a few different options with Twitter advertising. One is used to garner followers, another to drive traffic/conversions and the third to generate leads. Keep in mind that with any of these tactics, the goal is to pay less than the result is worth to you. Be sure to consider the lifetime value of a new customer or lead though. A lead for a general practitioner, for example, could result in several thousand dollars-worth of revenue. This type of advertising is geared toward—you guessed it—gaining followers. These types of ads will show up as ‘Promoted Tweets’ on a user’s timeline and as ‘Promoted Accounts’ in the ‘Who to Follow’ boxes on the Home, Profile and Search results pages. You’ll need to set up an account in Twitter Ads by submitting your country, time zone and payment details. From there, you’ll pick Followers from the Select a Campaign Objective menu and create a name for your campaign. You’ll be able to tailor the dates that the campaign runs and the audiences you want to target. If site traffic and conversion are the name of your game, this digital advertising option is for you. The Website Clicks or Conversions campaign generates conversions in the form of specific page views, email signups and product orders. You can access this option by opening ‘Conversion Tracking’ under Tools in the top navigation bar. Select the option to ‘Create New Website Tag’. After giving the tag a name, you’ll be able to choose the type of conversion you want to track, including Site Visit, Purchase, Download, Signup or Custom. Assigning a value to each conversion lets you report sales revenue against advertising costs. You’ll need to insert your Twitter-generated code on the relevant page of your website for that conversion. This could be an order checkout page, for example. This tag is used to send successful conversion data back to Twitter ads. Giving you a cohesive campaign report. Once conversions have been successfully set up, you can drop down from ‘Create New Campaign’ to choose Website Clicks or Conversions. Then, you’ll define your audience and budget. Unlike other advertising options, you can target interest by keywords rather than the broad, predefined interests. You’ll be able to choose where your tweets appear and which tweets to include in your campaign. These can be new tweets or your historically high-performing tweets. With a Website Card, you can include a featured image, an extra 70-character headline and a call-to-action button. Hiring a digital advertising agency to manage your Website Clicks or Conversions campaign can help you get the biggest bang for your buck. If you’re going to get the digital advertising 101, you need to know about the Lead Generation Card. Start your Leads on Twitter campaign with a Lead Generation Card to make it possible for users to opt-in with one click. Details auto-fill when the tweet is clicked on, making the conversion process hassle-free. Use the details visit the ‘Create New Campaign’ drop-down menu and choose the Leads on Twitter option. Next, identify your audience, choose your ad visibility and set your budget. Then, all you have to do is create your tweet and launch it. Keep in mind Twitter stores the lead information, So you will need to download them separately or export the leads manually. Contact us for more information about how we can help you get started with your digital advertising. Digital agencies can set you up with paid social and search engine advertising. If you’d rather go with unpaid social media marketing, check out our social media services. However be sure to reference this guide whenever you need digital advertising 101! Also let Ontarget Interactive know if you need help with you digital presence.